Aurora is excited to welcome several new members to the executive board. Tim Peters is the new representative from Illinois DOT. Tim takes over for former chair Dean Kernan, who retired last year. Travis Lutman recently replaced Mike Kisse as North Dakota DOT representative, although Mike remains involved on project teams and in meetings as time allows. Abner Johnson is the newest board member, starting just a few months ago as representative from Ohio DOT. Leigh Sturges replaced recently retired former chair Ralph Patterson as Utah DOT’s representative. Finally, Robbie Prezioso is the new Virginia DOT board member, replacing long-time Aurora founding member Dan Roosevelt. Welcome to you all! 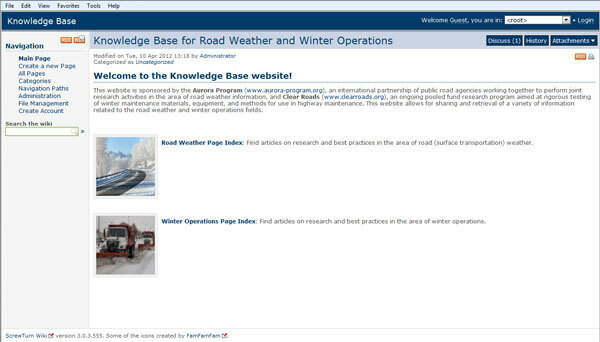 The knowledge base also includes an archive of many past discussions on the Snow and Ice Pooled Fund Cooperative Program (SICOP) email list-serve. Members of this list and participants in discussions include DOT staff, retired engineers experienced in dealing with winter weather conditions, and other engineering professionals. The list serve is primarily used for asking questions and seeking guidance, on snow-ice related topics, from the whole group via email. Topics in this archive include mobile sensors, training, anti- and de-icing materials, pre-wetting, and equipment corrosion. Under the Road Weather area of the site, the Aurora Program has created several pages detailing their 43 completed research projects. This research covers all of Aurora’s areas of focus, including ESS and other equipment specifications, weather modeling and forecasting, mobile sensing, and communications technologies. As with all of the pages of the “wiki”, this information is also categorized and linked through the site software, making searching more simple and efficient. Under the Spring Operations area, Clear Roads has also detailed their research efforts. The areas covered include plow blades, chemicals, spreaders, and traveler information applications. The Iowa DOT has been very active in utilizing portable and “smaller” road weather stations. Mini RWIS sites address the need for inexpensive systems to provide a specific set of road weather information. The installation of traditional RWIS sites is an important practice, yet sometimes all that is needed to monitor a certain location are a few key road or weather elements. Former Aurora chair Tina Greenfield has created a page detailing the Iowa DOT experience in this area. Specifically, mini RWIS allows for a specific need without the expense of over-equipping. Sometimes Iowa DOT engages in studies or evaluations that require road weather data, but the test location is not near an RWIS. Additionally, road construction or other events can require the removal of RWIS sites or key sensors until the work has completed. Portable weather stations can provide quality information at temporary locations and can be set up near an ailing RWIS site to provide needed information until the full RWIS can be returned to service. More information can be found at: http://knowledgebase.aurora-program.org/. A page has been created that outlines the level of effort that should be undertaken on different categories of roadway during a winter storm event. For example, after an event has ended, the effort will switch to cleanup with the intermediate goal of bare/wet pavement and finally the ultimate goal of bare/dry pavement. The time to achieve these goals will depend on the limitations imposed by climatological conditions, the availability of resources, and environmental concerns. More details can be found at:http://knowledgebase.aurora-program.org/. The knowledge base site is meant to be an ever-changing and expanding work in progress, as people add and update information. The true value of the website will be realized as members of the winter weather community contribute their wealth of knowledge and experience. To add material, you must first create an account. Follow the online instructions (http://knowledgebase.aurora-program.org/). Improvements to the site functionality will continue to be made, so if you have suggestions or comments, please contact Chris Albrecht at calbrecht@iastate.edu. The objective of this project was to determine the weather events that affect winter operational performance, then develop a software application that can automatically extract NWS data and calculate differences in weather across a region. The result of the project was a customize-able weather index online calculator. The index uses weather information from various weather networks to assess the severity of a user-defined area and time period. The user can modify the index by selecting different weights for individual weather parameters, such as road icing and blowing snow. Aurora members have unrestricted access to the online calculator for two years. This project involved extensive testing of the RGT friction unit, as well as more extensive cross-validation and data analysis that was conducted under Project 2006-04. This research involved a third and final phase of the intelligent image-based winter road condition sensor research effort. The goal of this third phase was to use one road condition classification system on all camera sites in Sweden. When researchers discovered in this phase that the accuracy was far too low when the equipment was moved to new sites, it was soon realized that the potential benefit disappeared immediately. The first two phases of the project had shown significant promise, and this third phase continued research and movement of the test site to new locations in order to acquire additional research data. The third National Spring Maintenance Peer Exchange was held in Bozeman, Montana on September 20-22, 2011. Aurora was a co-sponsor, along with Clear Roads, of this event. Like earlier events in Ohio (2007) and in Wisconsin (2009), this exchange brought together state DOT snow and ice control experts and private-sector providers of services, equipment, and materials to share information, network about snow and ice control issues, and develop research problem statements. The peer exchange website documents the progress made on past research needs statements identified at the first three peer exchanges. Under this project, a report was developed that reviewed the state-of-the-art within the meteorological community in regards to measuring the performance of weather forecasting information, review the current status of RWIS verification efforts by public agencies, establish procedures and parameters that can be used to measure forecast accuracy in any country, and benchmark the accuracy of forecasts provided to member agencies. Jack Stickel, Transportation Information Group Manager at the Alaska Department of Transportation and Public Facilities, has been the department’s Aurora rep since Alaska became a member in 2003. A 25-year professional meteorologist before joining the Alaska DOT&PF, Jack has a long-standing enthusiasm for road weather information systems. Jack cites three—no, four . . . no, five—well, many benefits of Aurora membership. Another benefit is the ongoing information sharing through Aurora’s online Knowledge Network. Jack helped to spearhead the development of this resource serving both Aurora and Clear Roads, a pooled fund program focusing on winter road maintenance materials, equipment, and methods. 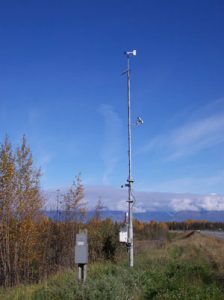 Third is the establishment of performance measurements regarding the quality and accuracy of RWIS equipment and data which, says Jack, will result in “increasing payoff down the road.” Alaska was instrumental in bringing Canadian road weather data into a Clarus data corridor for the Alaska-Canada highway. Another benefit Aurora provides is as a venue for cultivating relationships with related organizations like Clear Roads and SICOP, plus private industry and universities. Regular joint meetings around the country allow these groups to share and learn from their common interests, agendas, and concerns. All these activities directly benefit the Maintenance and Operations division of the Alaska DOT&PF. At another level, however, Alaska’s Aurora membership adds value as a “mitigating factor” in other divisions as well. For example, Alaska partnered with Aurora states in a case study using roadway weather data in a seasonal roadway weight restriction decision support tool. 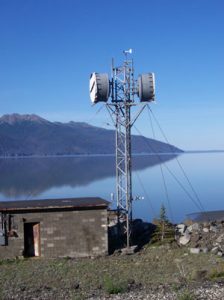 RWIS also plays a role in Alaska’s avalanche detection systems and has potential application in automated traffic management systems. Jack is passionate about a new FHWA program, Weather Responsive Traffic Management (WRTM). In addition to providing roadway condition information to travelers through 511 telephone access and websites, the WRTM will investigate providing weather and road-condition based, automated traffic control systems like variable speed limits, dynamic signage, etc. RWIS will be critical to such systems, providing opportunities for Aurora and FHWA to work together.